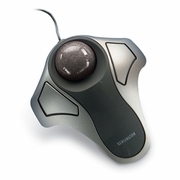 Kensington Orbit Optical Trackball Mouse. Control your cursor with a simple touch of the finger! The highly accurate Orbit® Optical is as easy to use as a regular mouse, but it stays in one place saving you valuable desk space. The precise optical tracking mechanism is also resistant to dust, reducing the need for regular trackball cleaning.